Any Ultrasonic Sensor can be used!! Overflowing garbage bins have been another cause of concern for residents in developing countries. With increase in population, the scenario of cleanliness with respect to garbage management is degrading tremendously. With the already prevailing diseases, the open containers are proving to be a breeding place for germs. Traditionally, municipalities operate on weekly routes to pick up trash and recyclables on designated days, regardless of whether the containers are full or not. My project aims to optimize waste collection and ultimately reduce fuel consumption. When the bin are placed at a particular position smartphone is required to detect its particular latitude and longitude only once. This reduces the cost of overall system; as GPS will not be required then. Basically, it will shoot sonar waves to know how much stuff is inside the container. We will also measure temperatures inside the container. Data collected from the sensors are sent over a cellular network (GPRS) for analysis and displayed on Ubidots web platform for customers. A list of containers to be collected can then be sent to drivers to plan an efficient route. The project will also include real-time monitoring of the civic body’s garbage vehicles using RFID. The vehicle owner has to flash his RFID card so that who and when and at what time garbage bin were emptied. It will help to curb laziness of the municipality’s garbage collectors. Essentially, this project is about collecting the most amount of materials in the least amount of time to reduce costs and emissions along the way. Furthermore, this project is supposed to work with any type of container and any type of waste, including mixed materials, paper, glass, metals and fluids. Thus, there will be saving in fossil fuel due to optimized route for collecting garbage and also thus transportation cost. Smarter way of Garbage Collection using "Smart Trash Can IoT System"
This section describes the hardware and electronics, in addition to a LinkIt ONE development board, needed to build prototype and provides details on how to put them together. Also, we will require 125 kHz RFID Cards. GSM antenna connected to GSM Antenna Port. 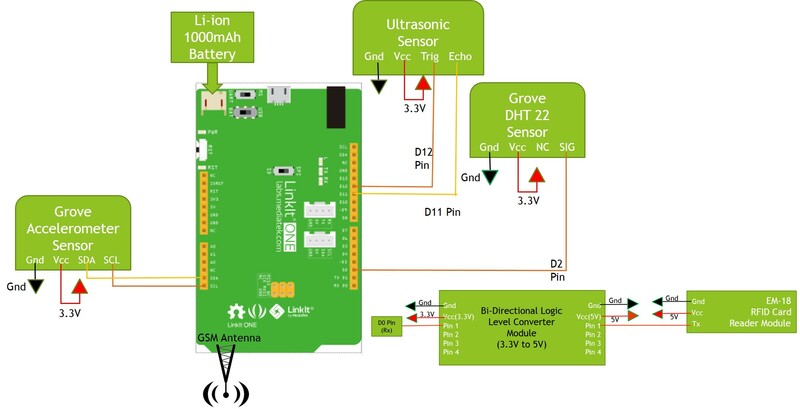 The antenna is provided in the LinkIt ONE development board’s kit and supports GSM 2G standards. Grove base shield is connected on the top of LinkIt ONE. Grove DHT 22 sensor is connected to the D2 grove connector of grove base shield i.e. to voltage (3.3V), ground (GND), D2 pins of LinkIt ONE. DHT 22 measures temperature and humidity. The detecting range of DHT 22 sensor is 5% RH - 99% RH, and -40°C - 80°C. And its accuracy satisfyingly reaches up to 2% RH and 0.5°C. Grove - 3-Axis Digital Accelerometer (±16g) sensor is connected to the I2C grove connector of grove base shield i.e. to voltage (3.3V), ground (GND), SCL and SDA pins of LinkIt ONE. LinkIt ONE development kit contains 1000mAh Li-Po battery. Connect it to the LinkIt ONE Board. Register on Ubidots and activate the account to prototype your own devices and applications. 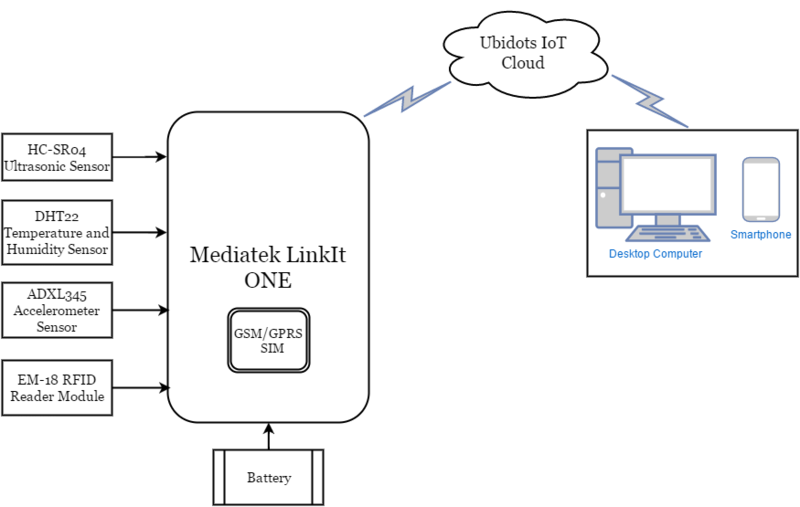 Use the Ubidots platform to send data to the cloud from any Internet-enabled device. You can also set triggers and alerts that can automate responses to data thresholds you set. Finally, all this is accessed by a powerful, standard and fairly well documented Application Programing Interface (API). Connections of all sensors and em-18 rfid reader module. //Reading battery level and checking if whether it is charging or not? digitalWrite(TRIGPIN, HIGH);    // The sensor is triggered by a HIGH pulse of 10 or more microseconds. of the ping to the reception of its echo off of an object. //Location where the prototype is placed!! while (!LGPRS.attachGPRS("APN name","UserName","Password")) //Enter correct Access Point Name (APN) according to your GSM provider. Username and password if not present then keep it empty. //Check whether any unauthorised activity is occuring with the device!! if (client.connect(URL, 80))  //Connnecting to ubidots! !